Being part of a community that has 7 billion people in it, you always want to stand out in some way, be different from the others, be better, feel better. And that is why you search for ways that make you unique and better, that let you take control of your surroundings. But do we find them easily? 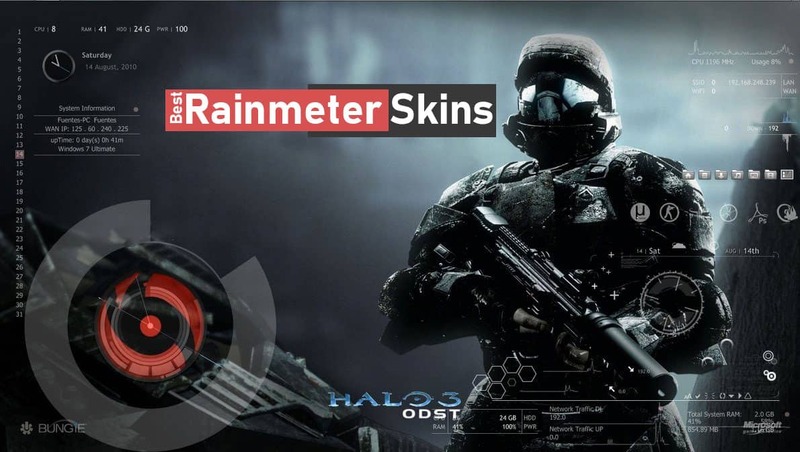 In this article we’ll cover over 20 best Rainmeter skins that you must try to give a makeover to your Windows device. Today, here, we will give you one of those ways on a silver platter. 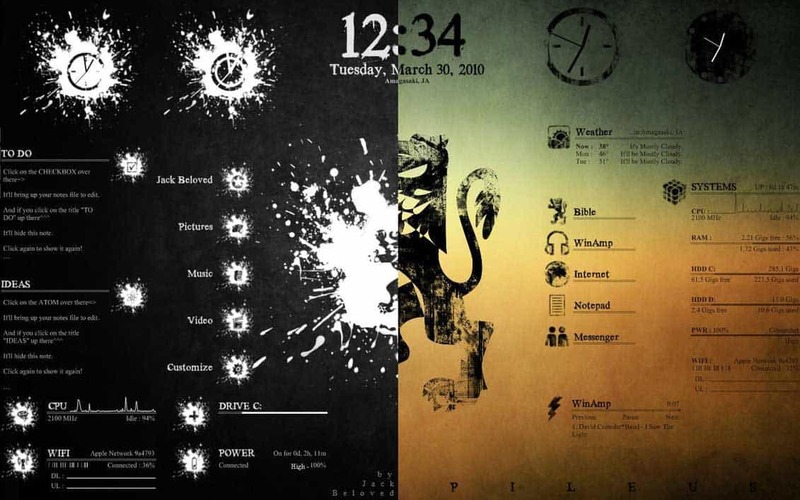 The RAINMETER is a computer program that lets you transform the way your Windows desktop looks, to a whole different and unique appearance all together. It gives you control over your desktop to make it look like it’s yours, to make it define who you really are. Are you a tech head that loves futuristic tech? Or are you a car enthusiast who loves cars and race tracks and gauges? Or are you a simple man who believes in elegance over pretentiousness? Ever know what it feels like to be in your favorite game all the time? Well, if not, you’ll know after using this skin! 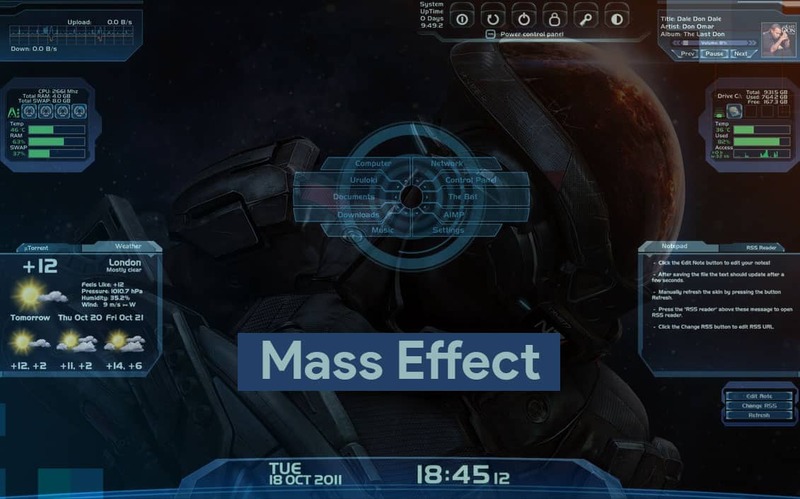 This skin from the game company BIOWARE resembles to the framework of its game, Mass Effect, which is very popular among fans all over the world. You’ll get the feel of being in the game every time you’ll log into your desktop. The game takes you to your very own journey of Commander Shepard, defeating the Reapers, with the help of his new age tech! This skin includes modules ranging from Hard Disk information panel network statistics bar. It even lets you control your media playback and shows you the time and date. And to make it all the more interesting, you can customize this as your own by re-arranging the panels according to your convenience and habits. There is always a certain appeal to the elegance of simplicity, wouldn’t you say? Senja Suite is a skin that is especially made for the people who appreciate simplicity and minimalism. It is intentionally made to only display the most basic information and controls, so as to make it easily understandable of course, but also to give using your desktop a sense of ease. Modules like Shutdown/Restart/Log Off buttons and Time and Date Centre take care of the most frequently used basics and do not throw too much into your face at once. This skin is ideal because it does not give you hundreds of other details of information that you don’t even need and don’t even know what to do with half the time, like some of the other skins. Instead it gives you just what you need, the basic controls and a gorgeous and elegant interface. The wallpaper you choose in a skin incredibly determines how your skin looks and feels to use on your desktop. The perfect example of this is this rainmeter skin called the ALIENS which is beautifully inspired from the hit sci-fi movie Aliens. The interface on this skin only looks interesting when you add suitable wallpaper in. Although you can choose any wallpaper you want, we recommend using the Aliens movie wallpapers that come in the program bundle with this skin. That way, you can actually experience how it was meant to be experienced, like being in the movie, like using the alien’s advance hardware. Talking about the modules, they are very informative on this skin, including Network Speeds modules, Disk Partition Shortcuts, Power Status and Time and dates modules as well. There is even a Google search bar from which you directly make a Google search and if that also isn’t enough, there is a live feed column that keeps you updated with local news! The Razor is also one of those Rainmeter skins that heavily depend on the wallpaper you choose for its background. Although this gives you a sense of freedom, a customizable feature on your skin, it also burdens you with the choice. It can be a disadvantage as easily as it is an advantage. If you do not choose wisely, you might end up with a normal looking desktop. You don’t want that when you’re going through the trouble of installing a skin to make it look good! But on the other hand, if you can choose right, this skin will make the most gorgeous rainmeter skin that you can install on your desktop! It displays a host of information including Power Status, Network Uploads and Downloads Speed and time and date. It has a customizable dock that means you can place your modules wherever you want on the screen and it also displays shortcuts to system libraries. Are you a person to hold elegance over modernity? Do you appreciate a little vintage, gentlemanly look in your possessives? Well then this skin is tailor made for you! 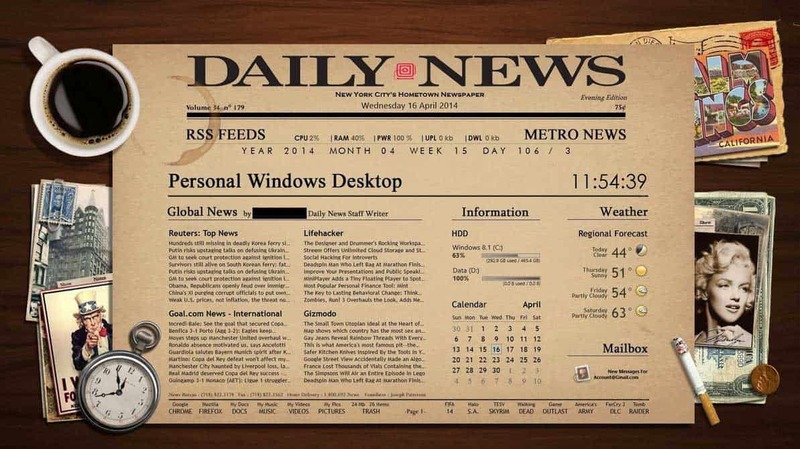 Newspaper Desktop, as the name suggests, displays your desktop with a newspaper look. It gives you the feeling of a fresh newspaper in the morning rather than a reminder of the previous exhaustive and monotonous day of job! The cigarette and the pocket watch module compliments the overall illusion and give you a perfect vintage and sophisticated look. Its rich-in-text nature lets it be very informative. Be it the CPU or RAM usage data, Network Stats, Weather Forecasts, Disk Space data or the time and data, its neatly arrange newspaper column shaped modules tells you all you need to know. If you have ever seen Iron Man or any Avengers movie, you definitely have imagined yourself in an Iron Man suit with your AI mammoth, Jarvis, telling you everything you need to know, whether it is about a mission or a person or a news report from 1969 pulled out of Google! Now we can’t promise you an iron man suit but we sure can give you your very own Jarvis, who will be at your helm of things and provide YOU with all the info you need. 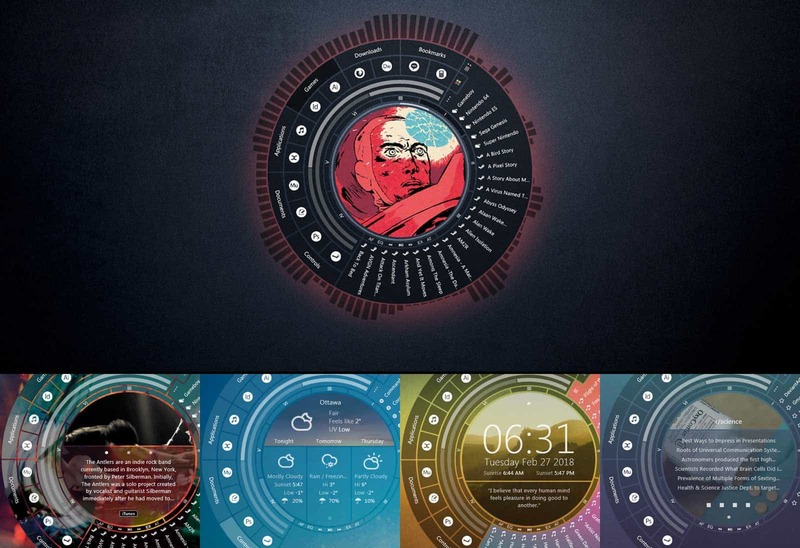 IronMan Jarvis is a rainmeter skin that has an identical appearance to that of Jarvis’s interface from the movie. This will surely give you the genius, billionaire and philanthropist, Tony Stark vibe you need. It will immediately make you feel like a computer mastermind as soon as you log onto your computer! Its modules appear to be incredibly futuristic as they emerge from an arc reactor core are displayed in a 3D interface. They show you your hard disk capacity, temperature details, your RSS feeds, various shortcuts to system folders and the time and date. This is probably the most popular desktop skin of all time. 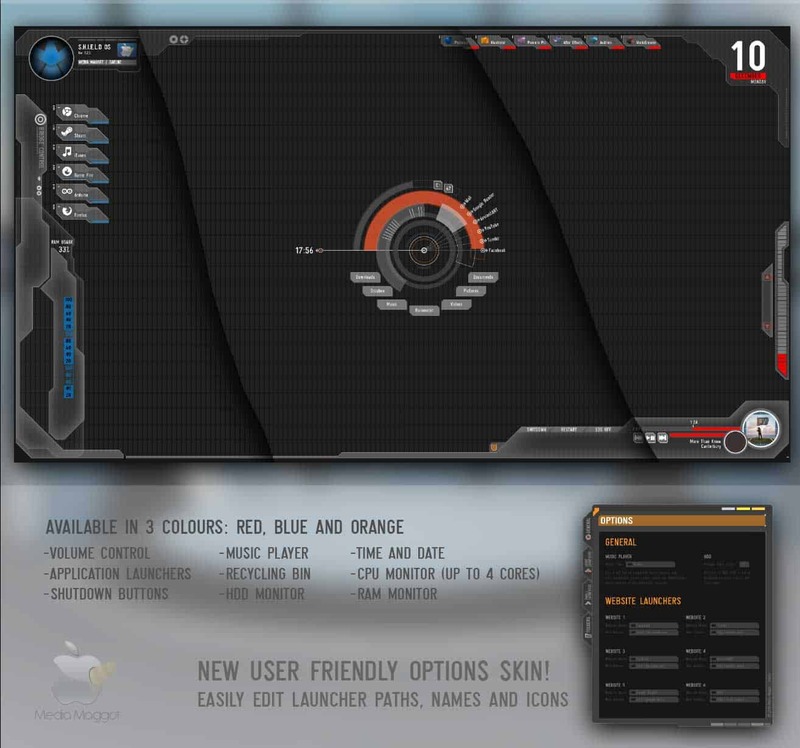 Enigma was the most downloaded skin in 2009 and was so popular that it was made the default skin of Rainmeter that year. Why, you ask? Well its beauty lies not in its appearance, but its design. Its game changer of a design shows you every bit of information you need to have about your computer, about the world around you and more! There are modules and sub-modules in this skin that are highly configurable and can be placed and rearranged individually. There are loads of different modules including World Time and Weather, Media playback control, RSS feeds, picture slideshow, CPU and RAM usage, quick notes, real time active processes and even more than you can possibly fathom. 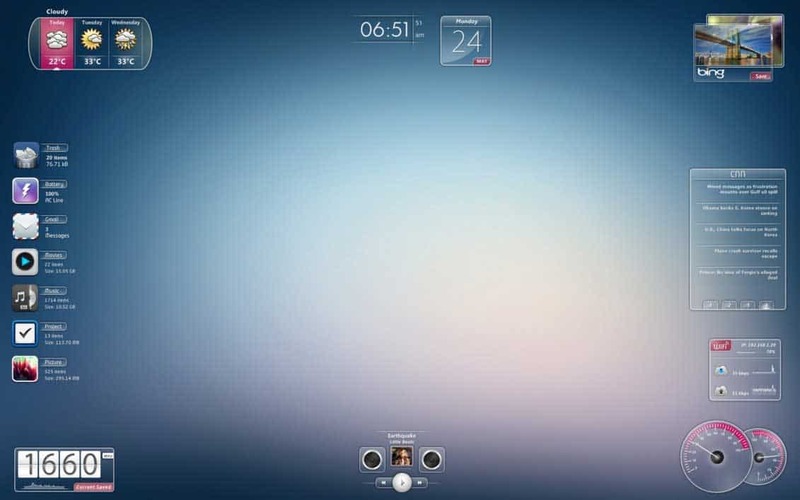 Wisp is a unique rainmeter skin in the sense that its modules do not have any boundaries. They look like random floating clouds on your desktop which can be very eerily good looking if you put the right background behind it. And this is exactly what makes it look different from most other skins out there which look much defined. Not having boundaries enables this skin to show you more information without appearing to fill up your desktop. Its modules show you your disk partitions and their usage, the temperature, weather date and time, the CPU and RAM usage and also the network speeds floating around your desktop. It also shows you the status of your recycle bin usage. LIM!T is a skin that uses its fonts and colors to display information not only in a textual manner but also visually, which when you get a hold off, will be incredibly easy to interpret. For instance, the minute numbers fill up as time passes. The minute number fills up as the minute passes and empties at the start of another minute. It displays every piece of information in such a manner while also using different colors and fonts to beautify the concept. The information it displays, include date and Time obviously, but also CPU and RAM usage, Current Media Playbacks, and even Weather Statistics. Basically this is a different kind of skin that lets you read your data in a visual manner, which can be very useful once you get the habit of it, as visual representation is always more easy to understand. 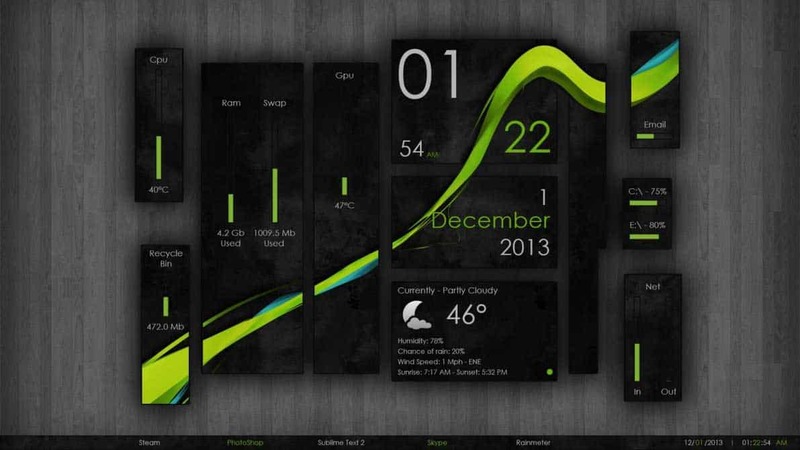 Unity is a rather simple and fundamentally basic rainmeter. But then again, we have established that simplicity is a power to reckon with, haven’t we. This skin, being simple in all its sense, can be a very useful skin for you if you are an office person and do not like a very “futuristic” or filled up screen. If you want your desktop to display only the regular and basic information in a visually unpretentious manner, then this just might be the skin you would want. It displays its modules in defined boundary confined boxes. The information it can display includes, Time and Date, Weather status, shortcuts to system folders and a fully optimized media control center. 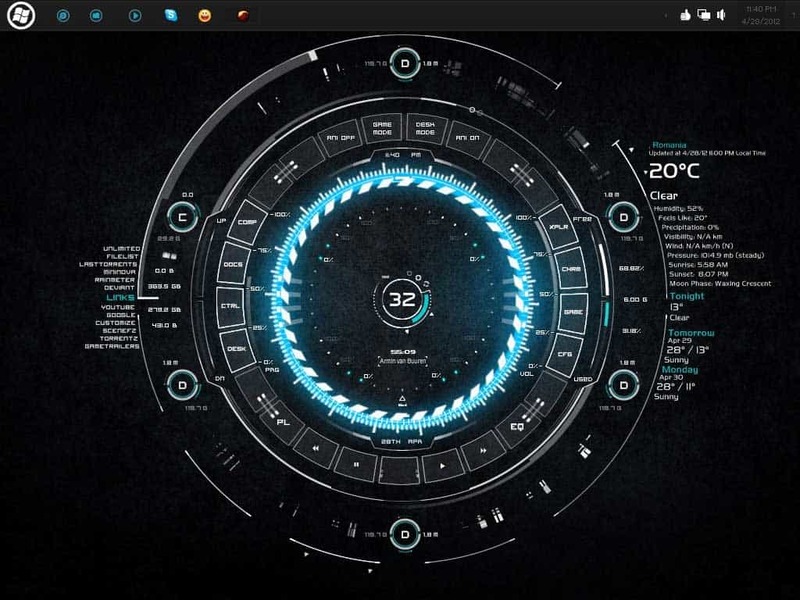 As you might get from the name, this rainmeter skin tends to fantasies of tech heads who like their desktops to be futuristic and give out an impression of a sophisticated and never before seen hardware. If you want your desktop to look like one of those supercomputers in the movies, the you should definitely check out this skin. Tech-A is an incredibly versatile and customizable skin too, since it displays its modules emerging in a radial. Because of this it is also open to the options of concentric circles displaying information inside and outside of the main radial. There are numerous modules on this skin that provide a range of information from disk partitions to date and time. To top it all, the mainframe radial also revolves, making it all the more interesting. This is a skin that is tailor made for every marvel fan out there. The thrill of being in a secret organization that deals with aliens, gods and other super beings, keeping the earth safe, will always remain unmatched. And getting to work in SHIELD, is as close as it gets. Now these types of secret organizations might only exist in comics and movies, but the Avengers SHIELD OS skin does not let you think so. It lets you feel like you are working right on the mainframe of their computers and playing with advanced hardware like Nick Fury himself! 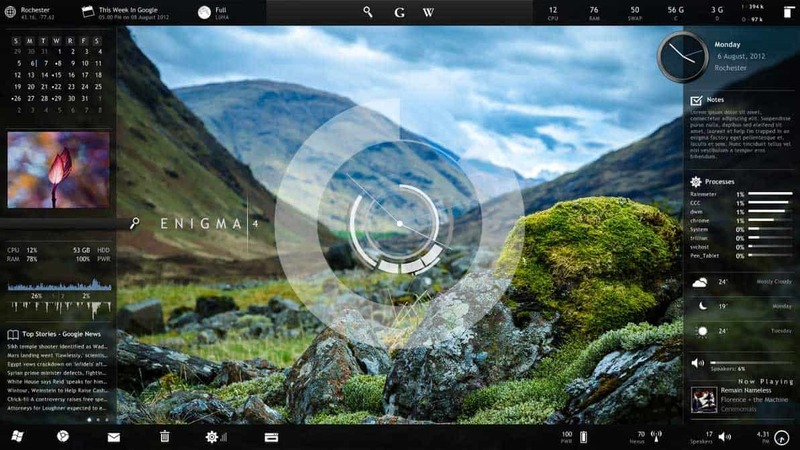 This skin includes shortcuts to various frequently visited applications on your system, like the browser or some game or even your media player. It tells you your RAM and CPU usage and gives you control of the media center, shutdown and restart and even the resolution of the skin! And of course the whole look of the skin is incomplete without the SHIELD eagle tag right in the corner! What is different about Eker Lina is that all of its sub elements are displayed in a consistent design that looks like floating widgets on your mobile phone. We recommend this skin strongly if you are using a tablet. 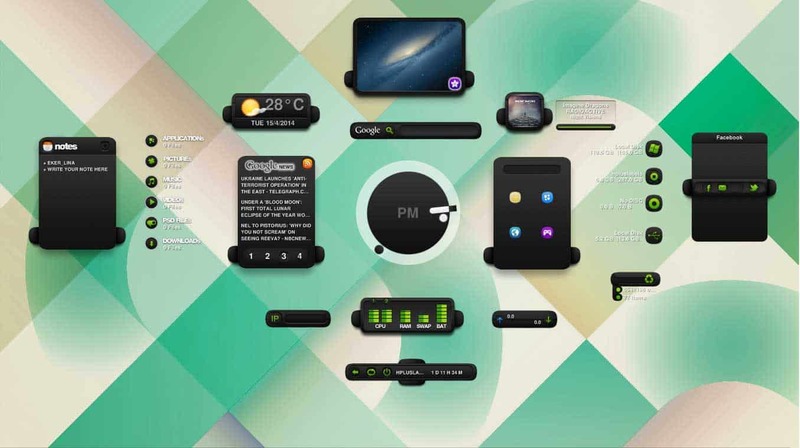 The look, although simple, is highly customizable, what with the options of coloring the widgets according to your taste, changing the background to your choice, and even arranging the widget looking modules on the desktop as you like. You can even eliminate a module if you want your desktop screen to look clean. It has variety of widgets that show you a lot of data like media playback controls, time and date, weather, RSS Feeds, and system drive shortcuts. If you like a little archaic look or a little scrubbed look like you see in manuscripts and old books, you will definitely like this rainmeter skin. All of its modules have an assigned icon that appears to drawn and scrubbed. This might not have an appeal to everyone out there, but it definitely looks attractive to some. It can also be made better with rightly chosen background wallpapers. But if we move ahead of the appearance and see what it has to offer in terms of functions, you might definitely be surprised. It has loads of different modules in its bag that can you can use and optimize your desktop with. It can display power status, RSS Feeds, Network Speed, provide you with shortcuts to commonly used applications like browsers, media centers, games, etc. It also has the option of light and dark variant to go with your favorite wallpaper of choice. 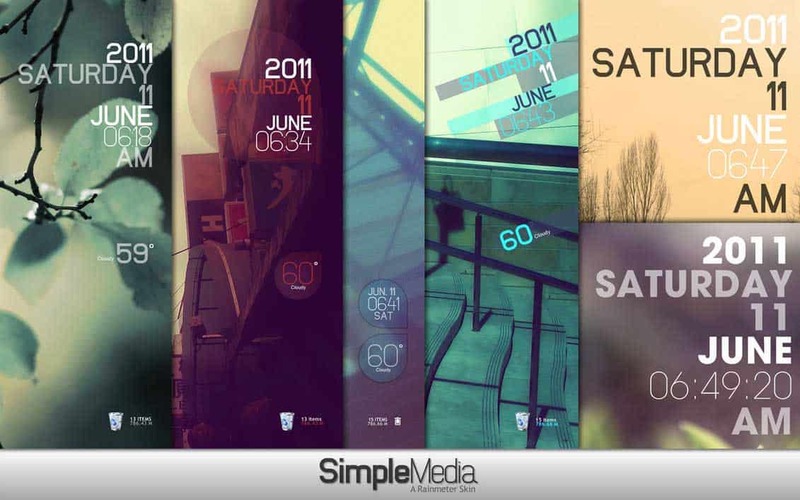 ABP is a very simple and light rainmeter skin that has a very structured and defined look with all of its modules shaped as rectangles. It has a consistent design with all the modules displaying information in drop down shadow boxes. For instance, if you click on the network center module, you will find that a light colored box drops down with all the options like Wi-Fi, Bluetooth, etc. and you can then choose either one. It gives you a rather simple but unified look on your desktop. .
Its modules display information like CPU and RAM usage, media playback info, slideshow of your favorite pictures and even more. Also Read: What is COM Surrogate (dllhost.exe) in Windows; can it be a virus? 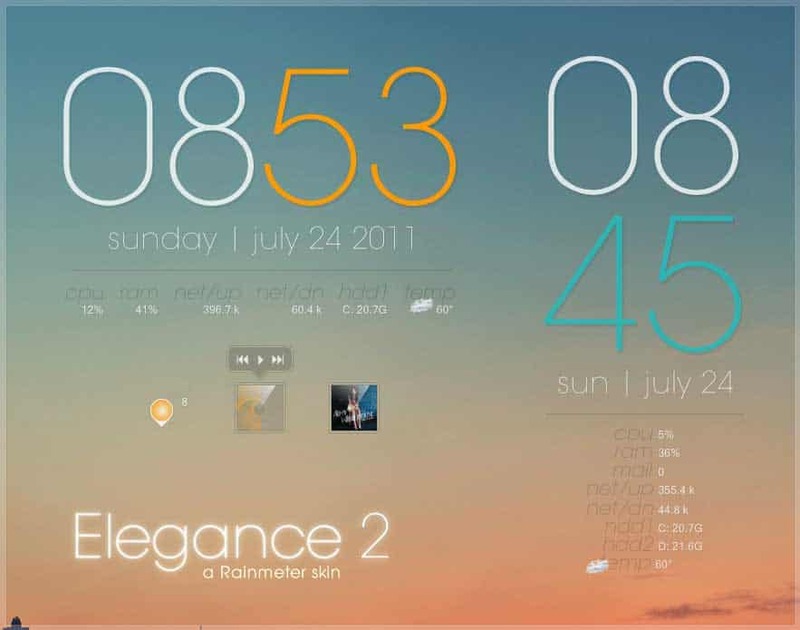 This rainmeter skin looks is made to look like gauges on a high speed automobile. It might be very appealing to people obsessed with cars. We recommend putting a race track or a highway through mountains wallpaper from the viewpoint of a driver, which will really bring out the futuristic car feel it was intended to give to you. Its modules can even be re-arranged so that you can put your gauges in such positions that they don’t come in your view while you are focusing on the race track! It displays a host of information and there is a “gauge” for everything. From weather status to time and date and form RSS feeds to unread email counts, it can show you everything at a glance. If that’s not enough, there is a direct search bar for Bing that lets you make quick searches without having to wait for your browser to open. This is probably the most simple looking rainmeter skin there is out there. And it definitely displays the power of simplicity in all its glory (ironical, right?). Displaying as little information as this rainmeter skin does at once, it makes it incredibly easy to understand and fast to interpret. You will love the elegant fonts on the modules in this skin. If you are a busy person with too much on your mind, you probably would want as less new and more important information as possible, to cross your mind every day, this skin is the perfect one for your desktop. It only shows you the most basic and required details of information and throws less into your face. It displays date, time, weather, recycle bin status and even the current local temperature. That is lot of information, when you consider how lightweight the skin is. Wanting futuristic tech is one thing, and being into totally alien hardware is totally another. 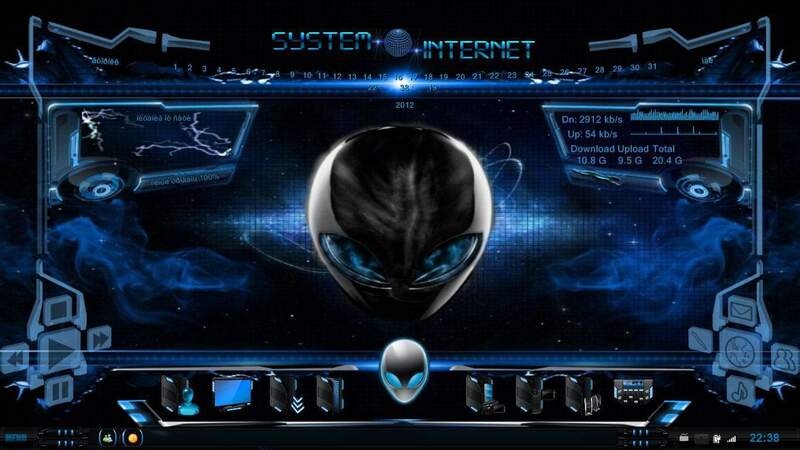 This skin does not only look futuristic, but it has a certain alienware feel to it. The interface of this skin resembles to that of a sci-fi movie alien spaceship where every control is through touching holographic projections! It is really a sight to behold! It is really configurable in the sense that it can be rearranged, the wallpaper can be changed and even the size of the projections can be adjusted. If you want your earth to look bigger, it will! 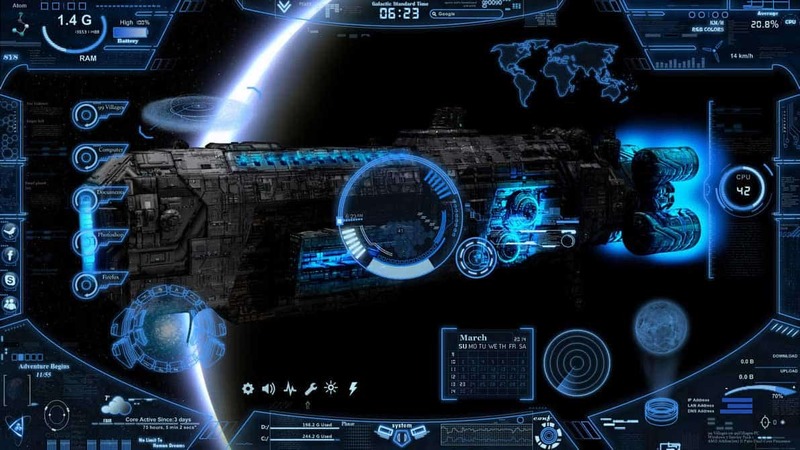 Other than a gorgeous alien look, it also has incredibly vast uses including media control, time, date and weather displays, CPU and RAM usage displays, etc. To add to the look, this skin also includes some holographic projections that are although useless, but look really cool. Well, to wrap it up in a nutshell, the elegance is embedded right into the name. Incredibly beautiful design, with visual display of only the most basic and required information, this skin is probably our most favorite one. Its time display in an irrationally huge font somehow compliments the whole look of the skin. This is extremely lightweight and is one of those skins that go with any kind of background image. Even if you put a solid color background behind it, you will find that it still brings out the elegance in your desktop. The main feature of its design is the size of the fonts of different modules. The relatively different sizes give it a kind of sophisticated look which is ideal. It shows time, date, weather, lets you control media playback, and even your recycle bin. 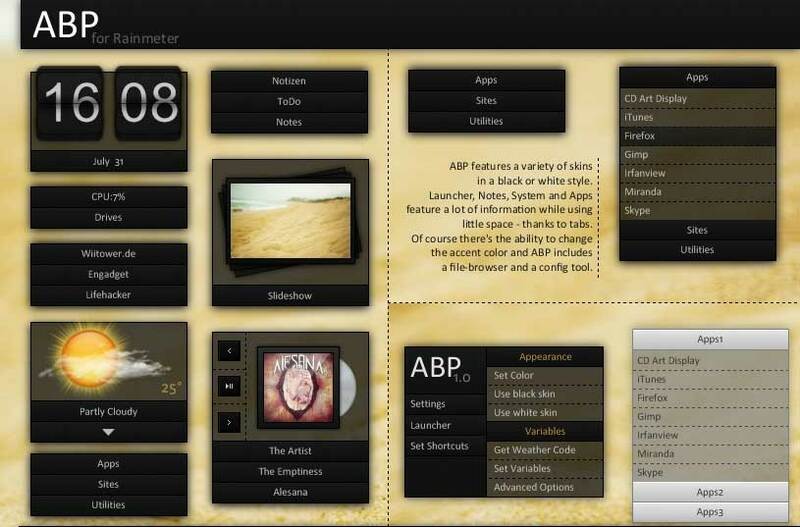 The Arc Menu launcher is a very popular theme among rainmeter users since it is not like the other skins. It does not look like a skin at all. It looks somewhat like a highly customized, futuristic OS. 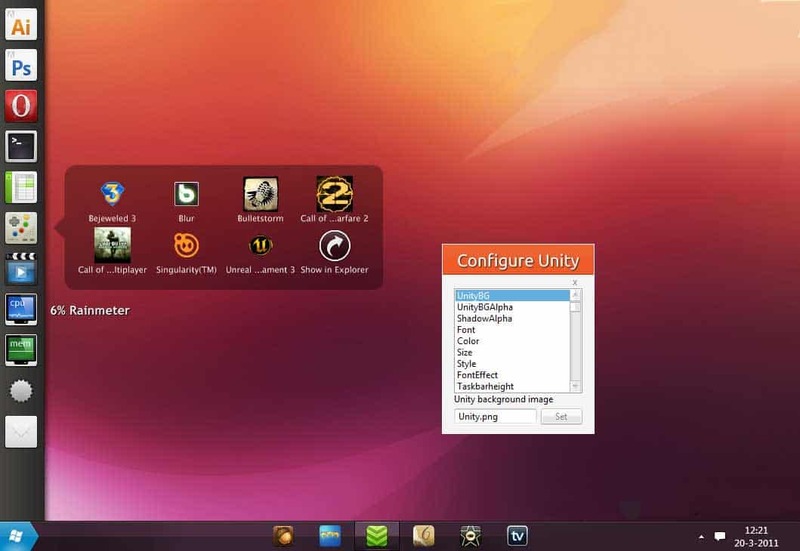 The launcher has everything to allow easy and fast access to different options and Application widgets. You can choose the customized icons to change the look of your default icons and get news feeds, weather updates, music control, etc. and also get current updates of e-mail notifications, weather, and much more. 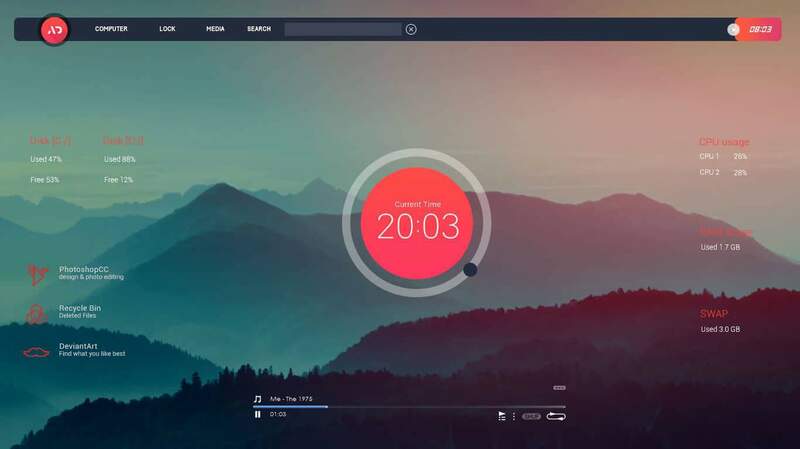 That’s our best list of Rainmeter skins that look really unique and cool on top of Windows OS. Do remember, using skins uses some extra hardware resources and is not recommended if you’re using an old Computer or laptop. You might experience some random freezing in Windows 8 or 10 as they already require too much resources. 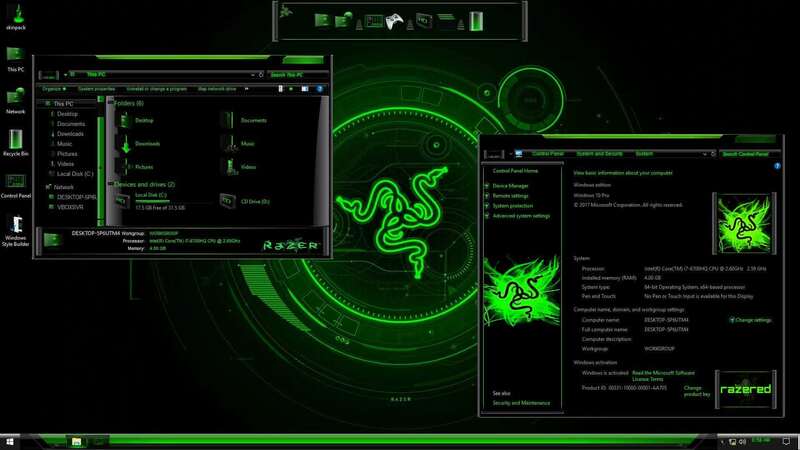 It’s recommended to have good processor, RAM & a graphic card to really enjoy this customizations.